There are a few sore heads around Pinata HQ this morning as last night was a cause for huge celebration. 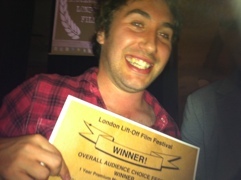 Last week we found out that we would have the honour of closing the first ever London Lift-Off Film Festival. 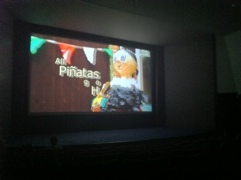 Yesterday, we showed up to watch ‘Pinatas’ for the first time on the big screen. It was an amazing experience and considering the other films on show, we were privileged to be a part of the event. 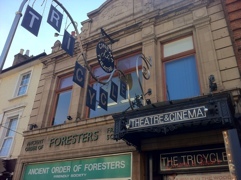 However, the celebrations didn’t end there as later in the evening we were awarded the festival’s top prize; the ‘Audience Choice Award’. This recognition and achievement left us speechless. We’d love to thank everyone who came to support us and everyone that voted for us too – you’ve made ‘Pinatas’ the success I always hoped it would be. We’d also like to thank the festival organisers for all their support and hard work. The festival was a roaring success and I have been informed it shall return next year, even bigger. Hope you all have a wonderful end of week/weekend, I’m now off to drink copious amounts of black coffee (the photo below explains it all really, and yes, that smile is still on my face). Bye for now!